★ Door Knob Covers help keep little ones from entering parents' rooms. Their sleek modern design blends in with any home decor. ★ Deter children from opening doors or getting locked in a room with a door knob cover. ★ Prevent children from opening or closing the door effectively. ★ Easy to assemble and clean. ★ Easy for adults to use and can extend the operating life of the door knob. ★ Prevent children from injury by opening or closing the door. ★ Ideal for standard round door knobs. ★ Special button design can effevtive protect babies' fingers from getting stuck. ✔ EXCLUSIVE LIFETIME MONEY BACK-GUARANTEE: If at any given point you're not 100% satisfied, we'll offer you a prompt and full refund of our child safety door knob covers! 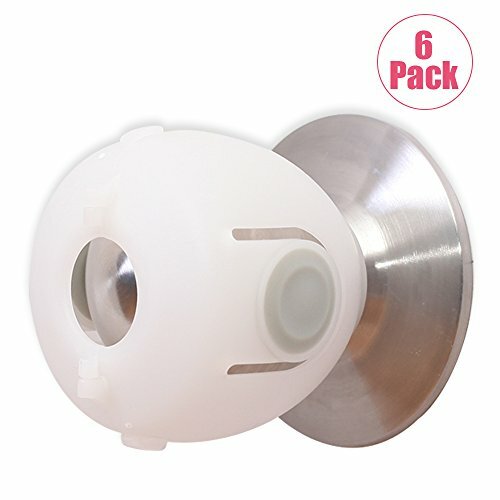 COLOR:Door knob cover is white and the simple design suit for the house well. MATERIAL:Soft PP and TPR will not cause injuries to children. EASY INSTALLION:No tools and no screws.Door knob lock is easy for adults to use. TIPS:Fits all standard door ball lock. Manufacturer: Ningbo Eudemon Child Protective Equipment Co., Ltd. Publisher: Ningbo Eudemon Child Protective Equipment Co., Ltd. Studio: Ningbo Eudemon Child Protective Equipment Co., Ltd. If you have any questions about this product by EUDEMON, contact us by completing and submitting the form below. If you are looking for a specif part number, please include it with your message.